As that we always need to keep our faces clean and exfoliated in the winter times I am so happy to be using this new Konjac facial sponge with activated Bamboo Charcoal! We know that sometimes we use rough towels to clean our faces and sometimes they can be harsh on sensitive skin. 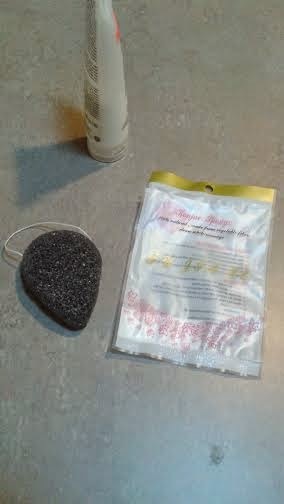 This sponge is 100% natural made from vegetable fiber and it cleans while you massage. *Gently exfoliates to bring back the natural glow of the skin,. As that this product its with charcoal its a plus for me because it cleans very deeply in the surface of my skin. I can use this product with or with out my face wash and it leaves my face nice and clear sometimes even shiny. I can use this sponge as soft as I want it or a little bit hard to exfoliate more. All I have to do is leave it in water and the sponge will soak the water and it will get very soft. Also love that it has a little round corner that I can use around my eyes, love the tear or water drop form. Because it’s natural that is a plus for me and I am very glad that I have no problems with any allergic reactions. It does help with my PH balance of the skin and love that I can use it even on the winter with my extra sensitive skin. To dry all I do is rinse it very good dab my fingers around it and then I hang it to dry. *I received this product in exchange for my honest and unbiased review, regardless I only recommend products or services I use personally and believe will be good for my readers. All opinions are 100% my own.